Not Enough Time for Marketing Your Local Business? What if it could just take 15 minutes a day? Proven 15-Minute Marketing Strategies Guide! 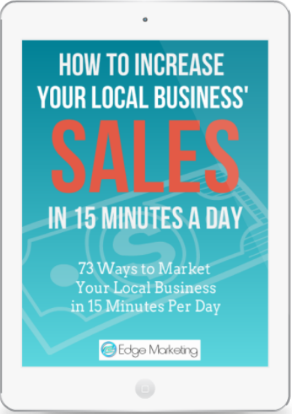 73 ways we market our own business in just 15 minutes per day! These are the strategies you need that will turn 15 minutes a day into more sales, more clients, acquiring lifetime customers, and start getting LOTS of referrals! FACT: Local consumers do business in their communities with those who they know, they like, and they trust. This isn’t anything new, it’s the way it has always worked in communities. That is the reason outstanding “10X” customer service is so vital to our business. Ask yourself this… what have you done this week to build the kind of relationship that’s necessary for your prospects and customers to have that kind of feeling about you and your business? How about this month? Have you really ever done anything to help them to know you better, like you more, and TRUST you? But who has time for that? Small business owners have so many other things to do! I’m right there with you. I share your struggle. I have felt your pain! That is why I’m offering you FREE my list of 73 proven strategies that can be done in just 15 minutes a day. If you will carve out and commit to doing these things for 15 minutes every workday, you will be amazed how quickly you will begin making more sales and get more referrals from happy customers who will WANT to recommend you to anyone they know.